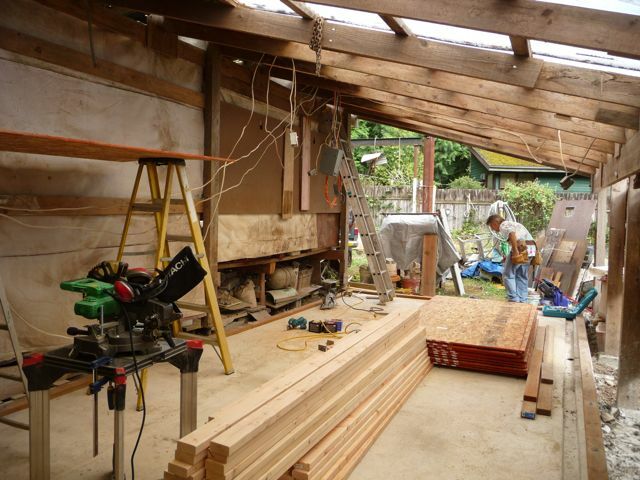 After my inspirational days at Pilchuck, I began a remodel of my studio space. Over the past 18 years, I have mostly worked outdoors under a roof but without walls. This is invaluable for the heavy removal of stone material which generates large amounts of dust. 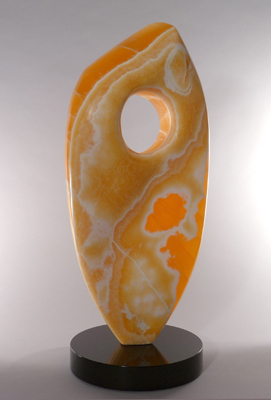 During the winter months, I would be tempered by the weather and this winter I wanted to work on glass and stone sculptures without the concerns of the weather conditions. This would require building walls, and plumbing the studio with hot water for the wet polishing that I do. Besides enclosing my studio, having warm water is one of the most important improvements I have made in my new studio space. As I had a couple of exhibitions and some shows to apply for I needed to get back to sculpting. 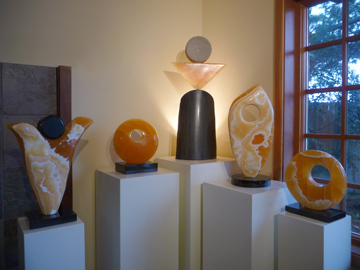 I have been carrying ideas from Pilchuck Glass School days inside of me, and waiting to get them started. 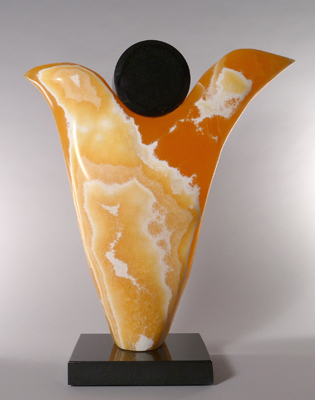 As my shows approached, I needed to work quickly to get some sculptures completed and cast glass sculptures are not quick to make. Casting glass is the most indirect sculpting I do. Imagine making a sculpture in clay or wax, and then making a rubber mold with a plaster mother mold, then making a wax of the sculpture which needs to be worked to the look I want, then making an investment mold in preparation for the glass casting stage. Then the wax is steamed out of the mold and the mold is then dried. This stage is the most critical in prepping for the glass to melt into the mold. Now the part that’s really slow, bringing the mold and the glass up to melting temperature, soaking it to allow the bubbles to rise, then cooling it ever so slowly to relieve the stresses in the glass, when it reaches room temperature, it is best to leave it in the unopened kiln for an additional day. The the devesting of the mold is the exciting part, where the quality of the casting is realized. If it is a good casting then the cold working and polishing of the glass sculpture begins. If the casting is not good, then you go back to the making of the wax and start the process over. This is why many people don’t cast glass, as it’s such a slow indirect method of sculpting. 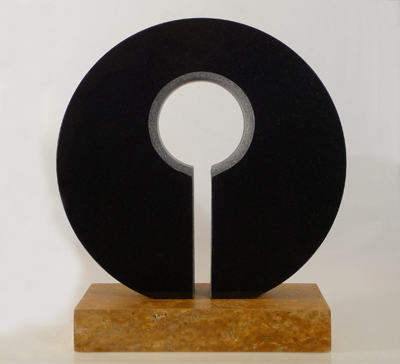 So I worked on stone sculptures, as I only had 6 weeks before the exhibition. 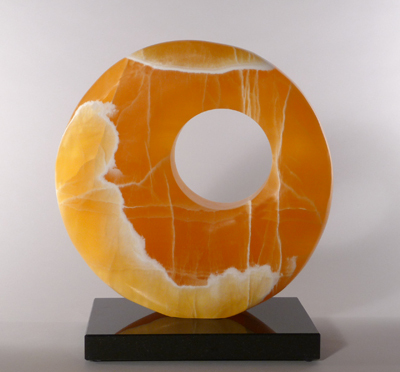 So I let my imagination open to work with my signature stone, an Onyx that is a beautiful orange/yellow calcite. And a new series began to be birthed. 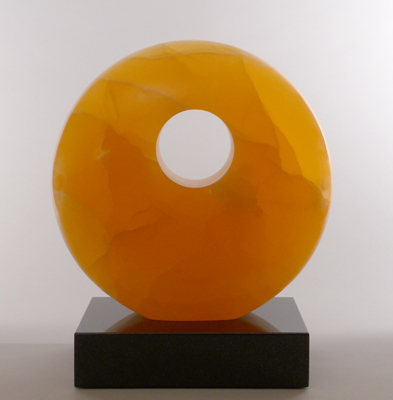 Bringing sculptures of light into this world is a great joy. See posted photos of the new work. Soon I will begin preparation for glass castings. I will post some photos soon to show you the direction I am taking with the same theme of bringing light into this world.